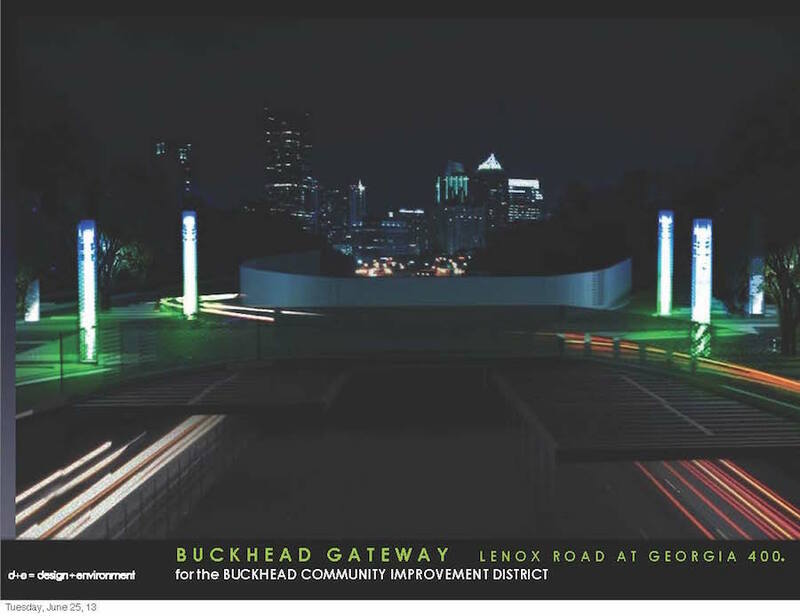 Atlanta, Georgia’s Buckhead Community Improvement District is forging ahead with a proposal to cap the GA 400 highway with a nine-acre park that could potentially double or triple the value of surrounding neighborhoods. Spanning one third of a mile, the floating park will connect Lenox and Peachtree roads, two arterial roadways, and cap the highway and MARTA line while providing access to the Buckhead Station. 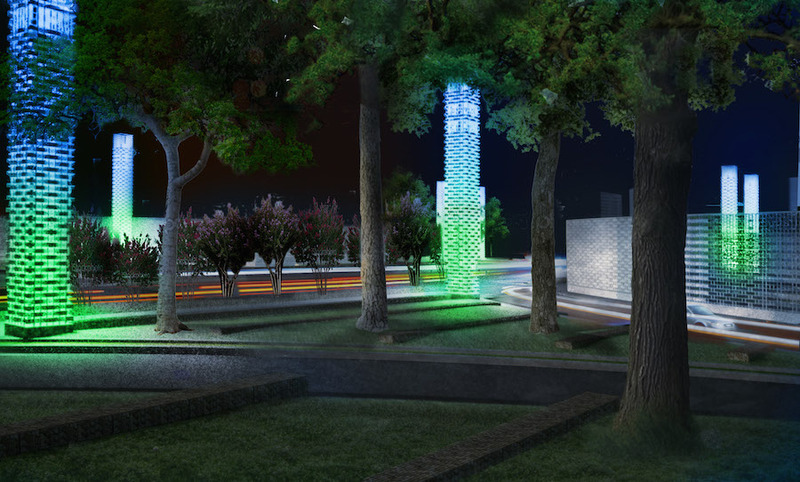 Currently in the feasibility stage, the park is being designed by local firm GreenRock Partnership and global engineering giant Jacobs. If approved, the public green space will connect via crossover ramp with the PATH 400, a pedestrian and biker-friendly overpass between Old Ivy Road and Lenox Road. 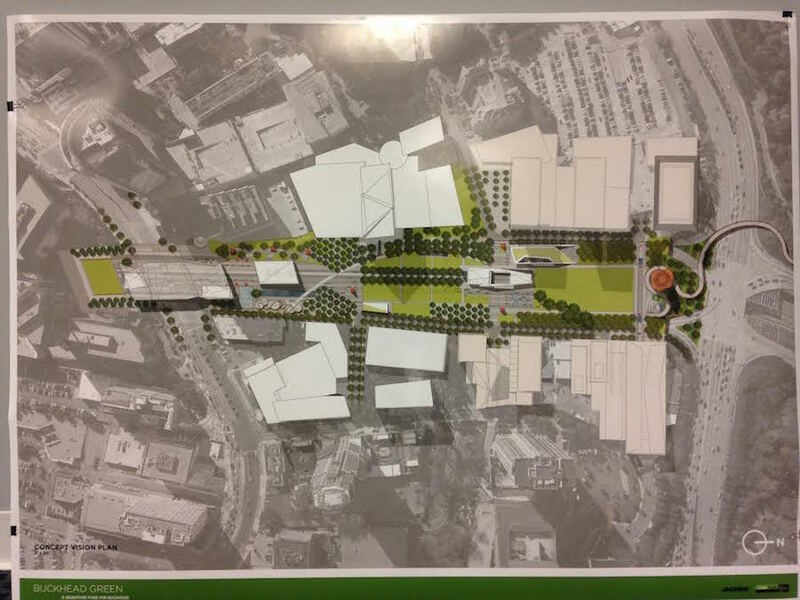 The addition will continue the trail through the heart of Buckhead’s commercial district and bring it closer to Lenox Square. 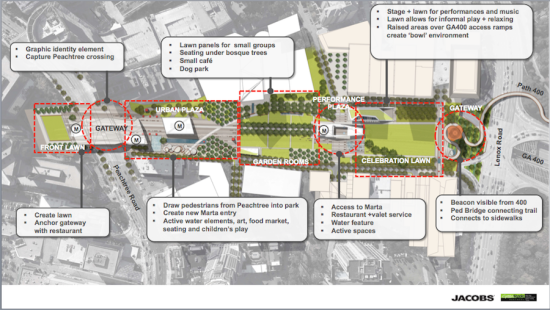 Renderings show a park with plentiful gathering areas, restaurants, new access to MARTA Station, and even a dog park. There will also be an active green plaza at the MARTA Rail Station’s main entrance, while the MARTA bridge portal will have a dedicated food truck area. For the northernmost tip of the park, David Allman, CID Chairman, imparted visions of a small-stage performance area large enough to accommodate 4,000-7,000 people and a public art installation. 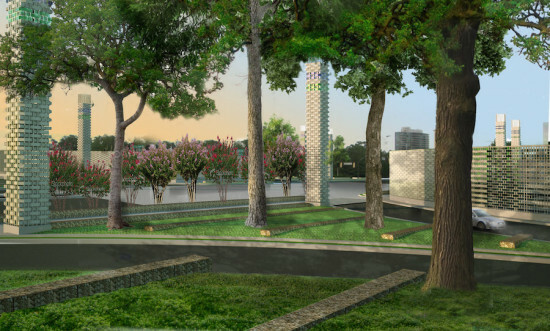 Allman cites a similarly large-scale, highway-superimposing project in Dallas, the Klyde Warren Park over an interstate highway. Construction cost $110 million but the park has since attracted two million visitors in two years and increased the value of surrounding office spaces threefold. The CID bills its public-private project as “an effort to transform an unattractive, barren bridge over the GA 400 into something that reflects Buckhead’s spirit.” The initiative coincides with a spate of high-rise residential developments, collectively bringing an influx of 700-plus units. On an adjacent site, high-rise offices are also proliferating, including the Three Alliance Center and a proposed office at Tower Place.